Without reading any research (none really published yet) I am first going to listen to the company’s conference call tonight. I could easily see the stock up or down $2-3 tomorrow, and I am not sure that either would cause me to change my positive outlook for the stock. Its important to recognize one simple fact that the chart below of SONO will be the first entry in a very long series of price points, and any price movements within that range in the near term are merely new investors digesting new news. If you were inclined to play for a breakout, but doing so with defined risk into the print, with the stock at $20,65, the Sept 20 calls offered at $2. These calls are 65 cents in the money already, so the break-even at $22 is up 6.5%, which should not be hard to realize in the next 9 trading days if the company does not disappoint. But it is important to remember that if you bought those calls, you are risking 10% of the stock price for 9 trading days into a potentially volatile event. 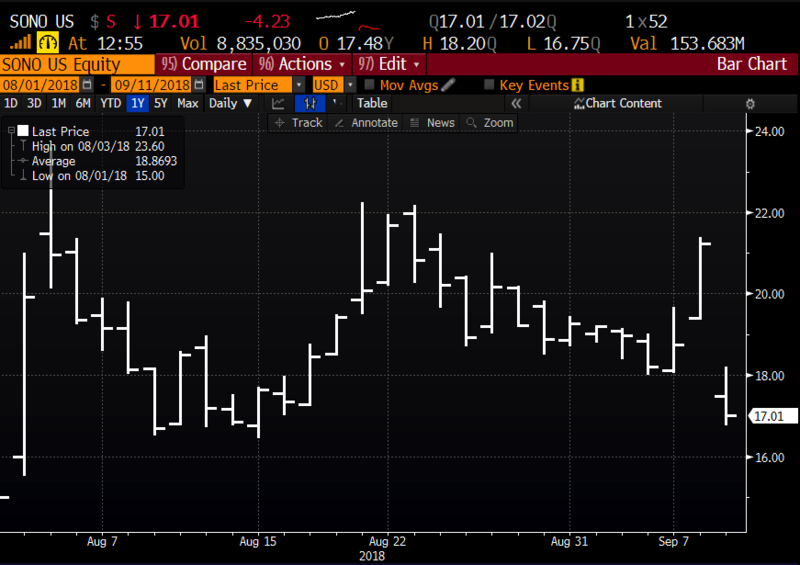 With the stock at $17 the Sept 20 calls can be sold at 15 cents, implying about a 10% chance that they will be in the money on Sept 21st expiration. Basically a total loss. This ended up being a very binary trade, if you got the direction wrong, and by too much there would be just too little time to have a chance to make anything back. But if you had been inclined to buy the stock into the print the risk-reward of owning the Sept 20 calls for $2 vs the unfortunate event of owning the stock down $4 from yesterday’s close would seem like a win. So as I said yesterday, ‘the stock up or down $2-3 tomorrow, and I am not sure that either would cause me to change my positive outlook for the stock”. The next identifiable catalyst for the stock will be Q4 results expected in mid-November, to suggest this report will be key is an understatement for two reasons. First, back to back disappointments out of its IPO and management will have a very hard time of ever looking credible again, and the guidance into the holiday selling season will be a sort of make or break for the company until they have new products and likely until next holiday season. And with the stock up nearly 10% today, and the implied move about 12%, the stock could easily give back all of these gains on news that is just in-line. In that scenario I would likely be a buyer of the stock in the high teens. So at this point, the keyword with the stock at $17.15 is “likely”. Given the sharp decline, it makes sense to see where this stock finds a bottom, but I suspect the $14 ipo price should serve as solid near-term support, which might set up decently for risk reversals, selling out of the money puts to help finance out of the money calls. But given that November options (which would catch earnings) it might make sense to wait to set up an earnings trade until Monday, Sept 24th when Nov is listed. The worst-case scenario on Oct expiration is the stock is 15 or below and you are put 100 shares of stock per 1 put short, plus the decline in value of the Jan 20 calls, which have about a 45 delta with the stock at $17, which suggests they will lose or gain about 45 cents per $1 move in the stock. If the stock is above 15 on Oct expiration the 15 puts would expire worthless, and then the Jan 20 calls will have gained or lost value depending on whether or not an increase in delta offset decay on a move higher, or a decrease in delta, and decrease in option value from decay increased the loss. Lets see how the stock trades in the coming week prior to Nov options being listed, but this trade idea will be a fun one to track for educational purposes.